More info:Price (per person) based on 2 adults sharing a room for 7 nights on a bed & breakfast basis, in our hand-picked selection of guest houses and small hotels. Includes rail and taxi travel as detailed, a guided tour of Hadrian’s Wall, and a York Pass. This eight day, tailor made rail holiday takes you around some of the North of England’s finest sites, cultural and natural. Starting in the cathedral city of York, where you spend two nights, you continue by train and travel by rail for the rest of the trip, through the Yorkshire Dales, along the historic Settle to Carlisle Railway and out along Hadrian’s Wall. 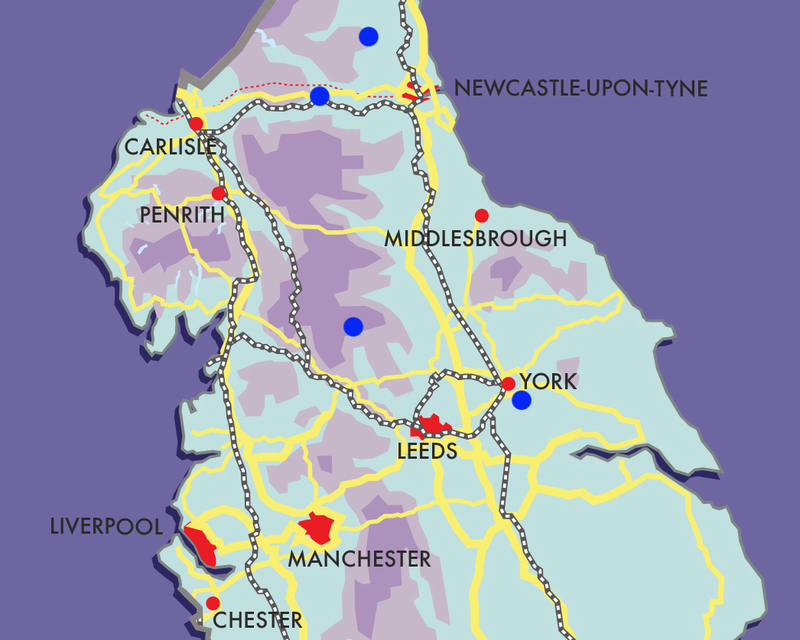 Stay in small, locally owned bed and breakfasts and guesthouses, with a fine Yorkshire welcome and a cup of the best Yorkshire Tea always to hand. such as William the Conqueror’s Clifford’s Tower, which has some of the best views in Yorkshire. Another wonderful view is from the Minster’s own tower too, with quite a climb of 275 steps. The National Railway Museum is a must on this rail tour but, wherever you go, this medieval city is crammed full of charm –be it meandering alleyways, tiny shops and cafes, ancient houses or, of course, fine pubs, including the Kings Arms on the River Ouse, famous for being flooded when rain overcomes the river bank, with visible flood marks on the walls. Travelling from York to Settle by train, this is a market town in the heart of Yorkshire, where you will spend the next two nights. With a history of textile mills, canals and railways, this is a fascinating town to explore. It is also a perfect place from which to get out on the hills, with walks out into the national park and plenty of shuttle buses to bring you back again, if necessary. Walks that we recommend include Malham Cove where you will get the most incredible panoramic views out to Yorkshire’s three peaks: Whernside, Ingleborough and Pen y Ghent, or you could choose to do half of it by bus. Or take an easier stroll through local villages and out to the fascinating Victoria Cave & Attermire Scar, not too far from Settle. The nearby Ribblehead Viaduct, just one railway stop away from Settle, is also a wonderful sight. No matter where you go in the Dales, however, you will find rugged natural beauty juxtaposed with fascinating industrial heritage. This historic railway line, opened in 1876, is one of England’s finest train journeys, cutting through the Pennines and Lake District and crossing a plethora of magnificent viaducts. Note that in 2016, due to a landslide and repair works, a bus replacement service was added on this journey between Appleby to Carlisle. At time of writing, the projected date for completion of all repairs is March 2017. This journey finishes in Carlisle where you will change onto the train for Haydon Bridge, the next stop on this rail holiday. Spend two nights in a charming, family owned guesthouse in the small town of Haydon Bridge, the gateway for visiting Hadrian’s Wall World Heritage site and Roman forts. The holiday includes a day long guided tour of various sections of the Wall, one of the UK’s most stunning historic sites, stretching for over 100km between the west coast and the east. Built by the Romans to keep back the Scottish Pict tribes from their already conquered lands, there are remains of castles, forts and Roman towns all along the route of the Wall. Highlights include the Roman Army Museum, Vindolanda’s archaeological digs and the fine forts found at Chesters and Housesteads. On the last day, take the train back to York, changing at Newcastle. We are always happy to help with travel logistics for any further travel. The accommodation providers we select share this commitment – many have kitchen gardens growing their own herbs, salad and vegetables, and some even have chickens roaming in the grounds to provide eggs for breakfast. Dinner menus focus on local specialities. We make it possible for our holidaymakers to learn more directly from the producers around the Yorkshire Dales and Peak District. On this trip, guests will stay in locally run B&B's in Haydon Bridge and York, where they are also given a pass which encourages them to explore many of the local museums and galleries. Local food and restaurants are pointed out, such as the historic Kings Arms in York and trying local produce is a focus on the trip.